Click to add a Cycle, Week or Session. Click to edit a selected Workout, Cycle, Week, or Session. Click to copy a selected Workout, Cycle, Week, Session or Exercise. Click to paste a copied Workout, Cycle, Week, Session or Exercise. Click to combine selected separate exercises into a single exercise. Click to separate exercises that are part of a superset. 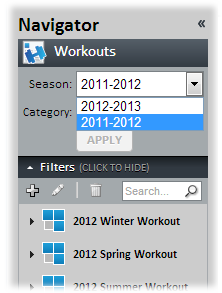 Click to delete a selected Workout, Cycle, Week, Session or Exercise. Expand the Workouts section in the Navigator. Enter the search criteria in the Search box. Results are automatically filtered. Click Filters to show the Season and Category filters. expand the Select the Season, specify the appropriate Categories, and click APPLY. Select the Season, specify the appropriate Categories, and click APPLY. Any Workouts matching the specified criteria are displayed. Click to update strength cards to include the latest changes made to Workouts. Click to print strength cards. Click to assign Athletes to the Workout. After Athletes are assigned to a Workout, strength cards can be printed. 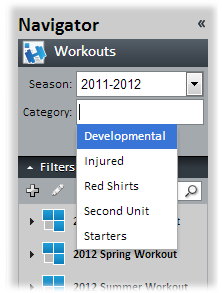 Click to delete strength cards for selected Athletes. Workouts are established under Seasons in the Navigator and are comprised of Cycles, Weeks, and Sessions. 1. 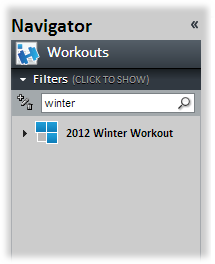 Using the Navigator, expand Workouts and click. 2. The Create Workout box is displayed. Specify the appropriate values and click CREATE. Name – The name of the Workout. Description – A description of the Workout. Create From – Select whether this Workout should be created from scratch or based on an existing Workout. Selecting an existing Workout duplicates the complete structure of the Workout but uses the Season and Start Week specified in this box. Season – Select the season for which this Workout should be created. Start Week – Select the day on which the Workout should begin. 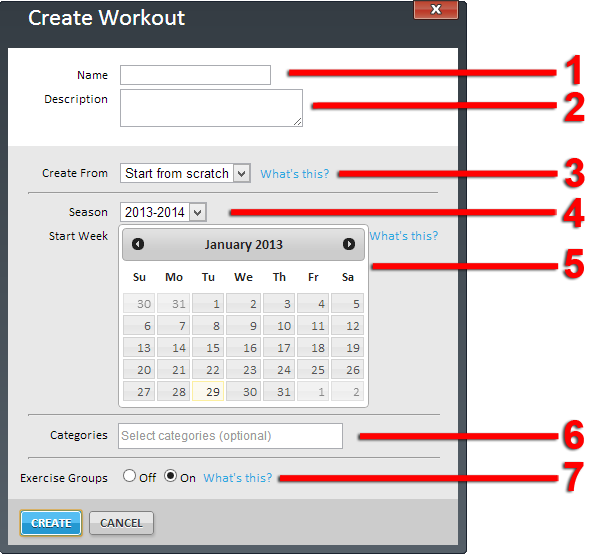 Categories – Select the categories for which the Workout is being created. Exercise Groups – Select whether the Workout will use Exercise Groups. 3. The new Workout is displayed. 1. Using the Navigator, expand the appropriate Season. Select the Workout to edit in the Navigator or in the Workout Designer. 2. Click the edit pencil on the Tool Bar. 3. The Edit Workout box is displayed. Make the necessary changes and click UPDATE. 1. Using the Navigator, expand the appropriate Season. 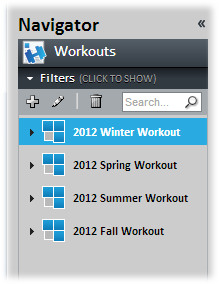 Select the Workout to delete in the Navigator or in the Workout Designer. 3. 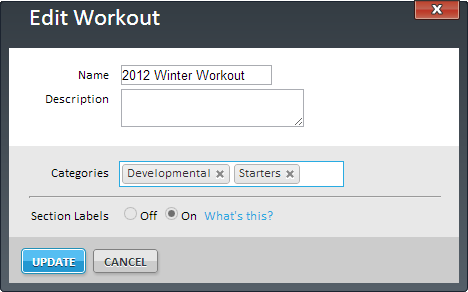 The Workout Instance box is displayed. Click YES. 1. Select the Cycle under which the new Cycle should be created. 2. Click Add and Cycle from the Tool Bar. 3. The Add Cycle box is displayed. A Description can be optionally entered. Click SAVE. 4. The new Cycle is displayed. 1. Using the Navigator, expand the appropriate Season. Select the Cycle to edit in the Navigator or in the Workout Designer. 2. Click Edit on the Tool Bar. 3. The Edit Cycle box is displayed. A Description can be optionally entered. Click SAVE. 1. Select the Cycle to duplicate. 2. Click Copy on the Tool Bar. 3. Select the Cycle after which the copied Cycle should be placed. 4. Click Paste on the Tool Bar. 5. The copied Cycle is displayed. 1. Using the Navigator, expand the appropriate Season. 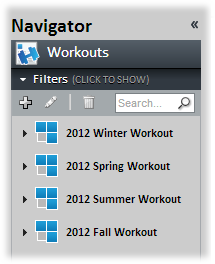 Select the Cycle to delete in the Navigator or in the Workout Designer. 3. The Cycle box is displayed. Click YES. All weeks and sessions that are included in the Cycle will also be deleted. Weeks are established under Cycles in the Workout Designer. 1. Expand the appropriate Cycle and Week for which the new Week should be created and click Add a Week. 2. The Add Week box is displayed. A Description can be optionally entered. Click SAVE. 3. The new Week is displayed. 1. Using the Navigator, expand the appropriate Season and Cycle. Select the Week to edit in the Navigator or in the Workout Designer. 3. The Edit Week box is displayed. A Description can be optionally entered. Click SAVE. 1. Select the Week to duplicate. 3. Select the Week after which the copied Week should be placed. 5. The copied Week is displayed. 1. Using the Navigator, expand the appropriate Season and Cycle. 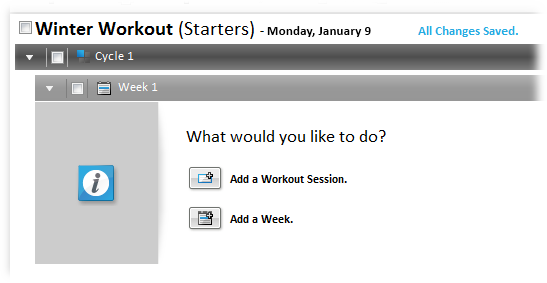 Select the Week to delete in the Navigator or in the Workout Designer. 3. The Week box is displayed. Click YES. All sessions that are included in the Week will also be deleted. Sessions, also known as Workouts, are established under Weeks in the Workout Designer. 1. Expand the appropriate Week under which the Session should be created and click Add a Workout Session. 2. The Add Session box is displayed. Select the day the Session is to begin and click SAVE. 3. The new Session is displayed under the selected Week. You can now begin adding Exercises to the Session. 1. Select the appropriate week under which the Session should be created. 2. Click Add and Session from the Tool Bar. 3. The Add Session box is displayed. Select the day the Session is to begin and click SAVE. 4. The new Session is displayed under the selected Week. You can now begin adding Exercises to the Session. 1. Locate and expand the Session to edit. 2. Make the appropriate changes. EXERCISES The list of available Exercises established on the Exercises page. 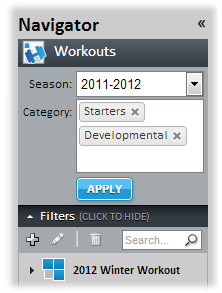 New Exercises can also be added by clicking the Session editor header. SETS+REPS Sets and reps for the Exercise. REP INFO Provides units of measure for non-weight-related Exercises or other Exercise-specific information. Rep Info can be entered by typing the appropriate value, which will automatically display matching results in a drop-down, or by pressing the DOWN ARROW key to display all possible values in a drop-down. Rep Info values are established on the Rep Info page. New Rep Info can also be added by clicking the Session editor header. LOAD (1 RM%) The percentage of the athlete’s 1 RM for weight-related Exercises. REST (min:sec) The amount of time the athlete must rest between sets. TARGET The target of either velocity or power that Athletes should achieve when performing Exercises that can be tracked by PowerTracker. If “Average Velocity” or “Peak Velocity” is selected, the value used is meters per second. If “Average Power” or “Peak Power” is selected, the value used is a percentage of watts in relation to other reps performed for that Exercise for the current day. An Average Velocity Target set at 1 meter/second. A Peak Power Target set at 60% of wattage for all the reps performed that day. DIRECTIONS Any special instructions relating to the Exercise. To change the order of Exercises, click the “grabber bar” and drag an Exercise to the appropriate location. The Advanced Set Editor provides the ability to specify more specific details for each Exercise. Click to open the Advanced Set Editor. REPS The number of reps for the Exercise set. REP INFO Provides units of measure for non-weight-related Exercises or other Exercise-specific information. OBSERVE SET Indicates the set must be observed by a trainer or strength coach. Target Measurement The target of either velocity or power that Athletes should achieve when performing Exercises that can be tracked by PowerTracker. Target Type Indicates whether the Target is either a specific amount of velocity or power (“Absolute Value”) or a percentage of velocity or power compared to other Reps performed during that Session (“Relative Percent”). When the Target Type is “Absolute Value”, the Target is the velocity (in meters/second) or power (in watts). When the Target Type is “Relative Percent”, the Target is the percentage of power or velocity compared to other Reps performed during that Session. After all changes are made in the Advanced Set Editor, click the SAVE button. Multiple Exercises can be grouped when they must be performed together. To group Exercises, select the Exercises that should be grouped together and click the Create Superset button. Grouped Exercises are identified by extended “grabber bar” located to the left of the Exercises. To separate Grouped Exercises, select one of the Exercises and click the Undo Superset button. Exercises can be deleted so they are no longer included in a Session. To delete an Exercise, select the Exercises that should be deleted. Next, click the Delete button. The Exercise box is displayed. Click YES. Coaches Note – A note that is only visible in the Workout Designer. Athlete Note – A note that is printed on all strength cards. Strength Card Note – A note that is printed at the bottom of strength cards.